Mesh wireless networks are a fairly new technology that can easily give you a consistent network signal throughout your home. They are easy to set up, usually quite fast, and well designed. This article will look at how they work, and also compare Eero vs Netgear Orbi mesh systems. A mesh wifi network does the same job as a traditional wifi network in that it aims to let multiple devices connect to a network wirelessly. The difference is that a mesh network allows you to cover a large area more effectively - particularly if you aren't a networking 'guru'. With a traditional network setup, you will usually have one main router that provides the main wifi signal for your home. The amount of coverage this will provide will vary depending on the exact router you own. Often, due to walls and other objects getting in the way, the further away from your router you are, the more the signal will deteriorate and the slower your connection will be (because the data rate drops). As well as this it will likely become less reliable which can eventually end in dropped connections and ultimately frustrated users. Now, on a traditional network, it is possible to extend your signal. This can be done using access points, or wireless extenders/repeaters. The issue with this comes from the fact that to do this you will either have to trail an Ethernet cable throughout your home (or buy a powerline/MoCA adapter) or set up a repeater which can be a complicated task. Or you won't have the extender set in the most optimal position for the best results. Even once you have done this, each device will essentially work as its own “mini-network”. In many cases (depending on the extender's capabilities) your device won’t swap between different access points even if it could get a better signal by doing so. This is where mesh networks come in. When you set up a mesh network you will still have a main router, but you will also have multiple other access points that you can place throughout your home. These routers and access points are all part of the same system so are designed to work well together. These access points will all be connected wirelessly, which means there is no need to add more wires to your network. Setup is also very easy as they are designed to work together. They use apps and an intuitive setup process, so that each satellite device is placed in the best possible position. Once your mesh network access points are set up, they will all begin to communicate with each other, and route your wifi devices optimally. This means that all the devices on your network will be automatically connected to the access point that provides it with the best signal. This process is also seamless, meaning if you were to, for example, walk from the downstairs kitchen in your home to the upstairs bedroom, your smartphone would automatically and seamlessly switch to the upstairs access point, therefore ensuring the best possible signal. Most mesh networks come with high-end wifi features that support multiple users. Compared to Netgear, Eero are certainly newcomers to the wireless networking world. However, they have also been in the 'mesh wifi game' longer than most. The first thing to note about Eero Wifi is its design. Each access point is a stylish, all white square, that looks great and would not have a problem fitting into any of the rooms of your house. In terms of hardware, each access point has two Gigabit Ethernet ports and one USB 2.0 port. Gigabit Ethernet will be useful for devices that need an extra consistent connection. While USB 3.0 would have been nice for a bit of extra speed when accessing your centralized file storage, these options should allow you to remain connected via wires where necessary. It's powered by a 700MHz quad core processor to ensure they will keep working even once multiple devices have connected. When it comes to the devices wireless capabilities, they are tri band and broadcast on the 2.4GHz, 5.2GHz, and 5.8Ghz bands and have MU-MIMO. Tri band will help you avoid congestion, while MU-MIMO will facilitate multiple conversations with more than one compatible device at the same time essentially making your network more efficient. These features are all complemented by Wireless AC which will let multiple users stream video or download files faster than older wireless standards. According to Eero, an average sized home should be well served by a pack of three access points, with each access point being good for around 1000 square feet. Of course, if your home is smaller or larger, you can simply add/take away as many access points as you need. The main Eero unit is called an....Eero (yeah, we know...) and additional units are known as 'Beacons'. Your network is controlled through an app that you can download onto your smartphone. This is a well designed app that can allow you to do things such as test your internet speeds and also check who is connected to your network. Eero is a well designed mesh network product that offers plenty of features to ensure you will get a consistent connection that is easy to set up for all your devices across your home. The Orbi is Netgear’s mesh wifi system. As one of the biggest names in the consumer wifi world, you would hope for their system to be excellent. But does it disappoint? The devices themselves are small, and white and realistically, fairly similar in looks to the product from Eero wifi although perhaps not quite as sleek. The one you prefer though will likely come down to personal preference. As well as this, each access point also comes with 4 Gigabit Ethernet ports (1 is reserved for WAN) and one USB 2.0 port. Again no USB 3.0, although each Netgear device has 2 more Ethernet ports than the Eero! The Netgear Orbi is Tri band with the third band dedicated to permitting only the Orbi devices to communicate with each other, allowing one 5GHz band and one 2.4GHz band to be dedicated to connecting your devices. In terms of network features, the Orbi has many including QoS, MU-MIMO, Beamforming, and even an inbound VPN service so you can securely access your home network externally. While the Eero has the first three features on this list, it doesn't have VPN support. Like the Eero, the Netgear Orbi also uses Wireless AC which will ensure fast speeds throughout your network. 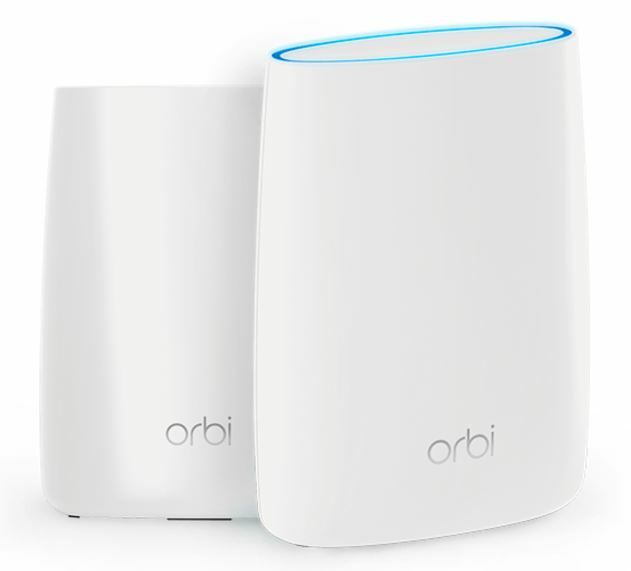 The first thing to note is that the standard Orbi package (the most popular one) comes with only two access points (a main router and a satellite unit). However, these are both very powerful and Netgear say that they should be able to cover around 4000 square feet. This is 2000 square feet more than the Eero! It is possible to add a further two Orbi satellites, should you have a very large home, with more than one floor. In total it's possible to have one main router and three satellites. All in all, the Orbi is a really powerful mesh network that you should certainly consider if you are wanting to upgrade your home network. Both these devices are great products that will allow you to easily set up a mesh network in your home. No more messing around with bridging or extending wifi with extenders - which can be really off-putting for those who aren't familiar with wireless technology. The Orbi and Eero make setting up a home wifi network much easier, especially for the tech-averse among you. Despite coming with only two APs, the Netgear Orbi actually covers more area than Eero’s three pieces. It is also generally easier to set up and can produce faster wifi speeds. Of course, this depends on the individual. Having said that, the Eero looks great and is a well designed product that may be a good fit for the right customer - in homes that aren't 'mansions'. Both wifi systems offer the option to add more Satellites (or Beacons) to each network. Before you go out and buy, make sure you do your research on the floor size of your home. Both Netgear and Eero have released recommendations on what package to purchase for your home size. This article has covered the most popular package for each. Have you got an Orbi or an Eero? Thinking about getting one or the other? Tell us about it below...?